Wadsworth Center scientists from the Mycobacteriology and Bacteriology Laboratories, the Bioinformatics and Statistics Core, and the Sequencing Core, supported, developed and validated a test based on whole genome sequencing that provides comprehensive resistance detection for TB. The TB Laboratory started work on a whole genome sequencing resistance test about five years ago. After demonstrating that the test provided rapid, accurate and comprehensive drug prediction, they began using it as the first line of testing on Oct. 1, 2018. The entire 4.4 million nucleotide genome is assessed, relating each new organism to past strains. Identifying the most closely related strains in this manner aids in epidemiological tracking. 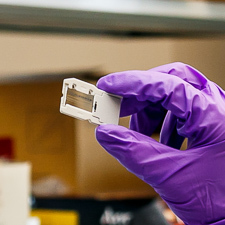 Dr. Musser, Wadsworth Center's Chief of Bacterial Diseases, says, "Testing with whole genome sequencing is faster than culture-based susceptibility testing and thus allows tuberculosis controllers and physicians to use the lab’s information more quickly, which is especially helpful for multidrug-resistant TB". Read the article to learn more Drug susceptibility testing for TB: poised to take a turn?